What a year it’s been: the 175th anniversary of the Rideau Canal and UNESCO designation of World Heritage Status for the Rideau Canal, Fort Henry and the Kingston fortifications. It’s been a busy year for everyone involved with the Rideau, and Friends has been no exception. Special thanks is extended to our Chair, Ed Bebee, for the exceptional job he did at organizing the mechanics of our Rideau 175 activities and for browbeating gently persuading many of the directors to come out and help staff our booth at various Rideau 175 events. Special thanks are also extended to our staff, our Office Manager, Nancy Lake and her very able assistant Lorrie Briggs, for the organization and enthusiasm they put into our Rideau 175 involvement. Many of our directors, such as our Rideau 175 rep., Sheilagh Dubois, also put in a large number of volunteer hours to make our contribution to Rideau 175 a huge success. So congratulations to all!! The Depot, our interpretive centre and retail outlet in Merrickville, also had a very good year thanks in no small part to the hard work of Dave and Jeanne Brett. Dave also gave many visitors a great Rideau on-water experience aboard his electric tour boat, the Harriet By. We also give a big thanks to Parks Canada for the opportunity to participate in Parks Canada supported Rideau 175 events and for allowing us to market Rideau 175 merchandise. This greatly facilitated our public outreach and fundraising efforts this summer. We received great support from Superintendent Gavin Liddy and all of his staff – our thanks to all. To ensure that Rideau 175 is not a one-shot deal, we’ve created a Rideau Legacy Fund so that the financial benefits we received from all the attention due to the 175th anniversary will serve the Rideau for years to come. The board of Friends of the Rideau unanimously agreed to put all the revenues from our sale of Rideau 175 merchandise into this new fund. The Rideau Legacy Fund is separate from our general funds and can only be used for legacy projects. So if you’ve purchased any Rideau 175 merchandise from us this summer, you’ve contributed to this fund. We also received a large donation into this fund from the Niagara Peninsula Paddlers Kayaking Club (see separate article on this page). There is talk that some of the wonderful Rideau 175 events may continue in years to come. For instance, this year was the successful re-birth of the Rideau Ferry Yacht Club Regatta, which the organizers plan to continue (as either an annual or bi-annual event). Everyone who attended the phenomenally successful Tribute to Labour at Jones Falls on September 1st also wants to see it as an annual event. This year was a great one for new books about the Rideau. FoR directors Ed Bebee and Ken Watson were very pleased with the reception for their new heritage books (Ed’s Fish Tales and Ken’s The Rideau Route). Lovers of mystery fiction snapped up Locked Up and Shillings. Coffee table book lovers had The Rideau Then and Now flying off the shelves. On July 11, 2007, the Niagara Peninsula Paddlers Kayaking Club presented Friends of the Rideau with a cheque for $3,864. This was an accumulation of donations raised for their 2007 Rideau paddle adventure. These funds have been placed in Friends of the Rideau's new Rideau Legacy Fund, a fund dedicated to projects that support the mandate of Friends of the Rideau and help preserve and promote the legacy of the Rideau Canal. The group paddled the southern half of the Rideau in 2006 and enjoyed the experience so much that they wanted not only to come back and complete the canal, but to give something back to the Rideau. 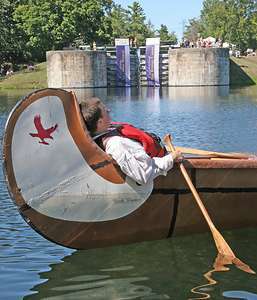 Hence the offer this spring to do their 2007 paddle as a fundraiser for Friends of the Rideau. Some 34 members took part in this year’s paddle which began in Smiths Falls on July 6th and ended on July 12th below the Ottawa Locks, out on the Ottawa River in view of Rideau Falls. A number of kayakers also paddled lakes, creeks and rivers connected to the canal. The club was extremely impressed with the camping experience at the Lockstations. The Lockmasters were most cooperative and went out of their way to accommodate the group. Since the paddle trip was being used as a fundraiser for Friends of the Rideau, Parks Canada kindly provided free lockages for the group. The 2007 Annual General Meeting of Friends of the Rideau was held at the Rideau Canal Museum on April 28, 2007. Chair Ed Bebee reviewed the past year’s achievements of Friends. This included our maintenance of both the Rideau 175 website and our own website; the republication of some of our brochures, including the ever popular “How A Lock Works” brochure; the production of our top quality newsletter; the operation our retail outlet and interpretive centre, The Depot, in Merrickville; and our involvement with many Rideau region groups and committees including the Rideau Heritage Network and the Rideau Canal Advisory Committee. Ed noted that directors Dave and Jeanne Brett very capably operate the Depot and that Dave also runs the very popular electric tour boat, Harriet By. Ed also thanked our office manager, Nancy Lake, for looking after all things related to our 1 Jasper Avenue office in Smiths Falls. Ed also reported that two FoR directors had released new books this spring, Ed’s own “Fish Tales, the Lure and the Lore of the Rideau” and Ken Watson’s “The Rideau Route, Exploring the Pre-Canal Waterway.” Both of these books provide fascinating new insights into the rich history and heritage of the Rideau Canal. Ed also gave a special thank-you to our official liaison with Parks Canada, Mary Ann Stienberg, for all the help and support she has provided to our organization, and to Superintendent Gavin Liddy for his strong support. Ed looked forward to the upcoming Rideau 175 activities, outlining Friends planned involvement with the Rideau 175 celebrations. At the conclusion of business (the financial report, minutes of the last AGM and the election of directors), Ed introduced the first speaker, Mark Brus, Project Officer with the Rideau 175 team at Parks Canada. Mark provided the audience with an overview of Parks Canada’s involvement with Rideau 175. The second speaker was Caroline Phillips, Senior Archaeologist with the Ontario Service Centre of Parks Canada, who presented a fascinating talk called “Digging the Rideau,” all about archaeological excavations at sites along the Canal. Caroline showed slides of various digs, especially the smithy in Ottawa under the Plaza Bridge. Chair: Ed Bebee; Vice-Chair: Vacant; Treasurer: Dave Edwards; Secretary: Sheilagh Dubois. Directors: Dave Brett, Jeanne Brett, Rowena Cooper, Dave Freeman, Mark King, Josephine MacFadden, Brian Osborne, Ken Watson. We congratulate the Merrickville and District Historical Society on the phenomenal Rideau lecture series that they organized this year. It provided a wonderful chronological journey, covering many different aspects of the Rideau. The series started with Brian Osborne providing a broad overview of the Rideau, past, present and future; Ken Watson took the audience on a 1783 journey along the Rideau; Victor Suthren took the audience back to the war of 1812, looking at the troubled peace and the decision to build the Rideau Canal; Mark Andrews detailed some of the interesting engineering features used in building the canal; Bob Sneyd dispelled the myth that canal was a failure, showing its great contribution to the early development of Canada (note that we’ve collared Bob to provide some articles on this topic - see page 6); Glenn Lockwood gave a fascinating tale of two Rideau settler families, one American, one Irish; Coral Lindsay and Mark Jodoin told the tale of the steamboat era on the canal. After years of preparatory work, the Rideau has finally achieved UNESCO World Heritage Status. As most of you know, it was in the last week of June, at the World Heritage meeting in New Zealand, that UNESCO designated the Rideau Canal, Fort Henry and the Kingston Fortifications (the Martello towers) a UNESCO World Heritage Site. The Rideau becomes the 14th World Heritage Site in Canada and first in Ontario. 1) The Rideau Canal remains the best preserved example of a slackwater canal in North America demonstrating the use of European slackwater technology in North America on a large scale. It is the only canal dating from the great North American canal-building era of the early 19th century that remains operational along its original line with most of its original structures intact. 2) The Rideau Canal is an extensive, well preserved and significant example of a canal which was used for military purposes linked to a significant stage in human history - that of the fight to control the north of the American continent. The impact of World Heritage designation is still sinking in. It will be the main topic of discussion at the Rideau Canal Symposium, to be held this coming November in Kingston (see www.rideau175.org for details). The designation does not bring any new rules or regulations (there is no legislative authority attached to World Heritage) – Parks Canada’s existing management plan will continue to be the guiding document for the canal. It does bring opportunities for those of us interested in the heritage of the canal. The designation should lend more weight to our efforts to preserve and enhance the irreplaceable charm of the Rideau Canal Corridor and to develop strong public support for the long term well being of the Rideau (which, not coincidently, happens to be part of the mission statement of Friends of the Rideau). Everyone involved with the Rideau Canal, including all our members, can feel proud of the World Heritage Site designation, unique in Ontario and only the second canal in the world to be so honoured. We all know the rich heritage of the Rideau Canal – now the rest of the world will too! In August 1842, a young English traveller and sportsman, John Godley, visited Kingston. Military officers talked about great deer hunting, and recommended “a hospitable farmer, of the name of Knapp, who lives on Lobra lake, has hounds, is well acquainted with the country and the sport”. Great expectations soon collided with grim reality. With a friend, D—, John hired a wagon for the eighteen mile trip. The “best part of the road was corduroy … the rest of it was generally a mere cut through the forest, in the midst of which the stumps were still left standing, the surface being further diversified by holes, in which our equipage might almost have been buried bodily”. About the return trip, Godley was equally sardonic: – “those who know what a Canadian wagon and a Canadian road are, will not be disposed to envy us”. They arrived at a frame house on the shores of Lobra (Loughborough) Lake, described as “a beautiful lake, twenty miles long, but narrow, and studded with hundreds of small, rocky, pine-covered islets”. The Knapp family soon got their guests some fish for dinner, accompanied by brown bread and water. The ferocity of the flies stunned Godley. “We had a pull on the lake, a bathe, a cup of tea, and so to bed. And now comes the dark side of the picture: – that night was indeed a night of horrors – I had not got into bed, but wrapped myself in my plaid and lay down on it; not, however, to sleep. I verily believe there is no species of creeping, crawling, or flying insect which had not its representative, on my person, nor was there one quarter of an hour’s intermission of (saving your presence) itching and scratching”. On their second night, the torture was even worse. Godley and D— decided to sleep in the kitchen – Godley on the table, D— on a bench: “in vain did we endeavour to escape from our relentless persecutors, and this manoeuvre had only the effect of adding hard lying to our other discomforts.” By the third night, they were so tired that they were almost able to sleep through the clouds of mosquitoes that were barely noticed by their hosts. The bright side — fishing. “There are … immense quantities of fish in the lake, principally black bass, which … are caught of three or four pounds weight; altogether, it must be, when there are no mosquitoes, a most desirable sporting ‘location’”. “Our host lives very well, i.e., plentifully, but in the most primitive manner. He is not much of a farmer, and produces no more than is necessary for the consumption of his family; his live stock consists of six cows, two horses, and a good number of pigs and poultry; the visits of sportsmen like ourselves, and occasional speculations in lumber, give him what money he requires for clothes, &c., and he has venison and fish for the taking. What more does he want, as far as worldly goods are concerned?” Amen! Amos never got title to the land, probably stemming from his active participation in the Robert Gourlay political conventions. The Government proclamation that convention delegates would be ineligible for land grants meant that it would have done Ansley no good to apply. The VanLuven family eventually took title. Reference: John Robert Godley, Letters From America, Vol. I, London. John Murray, Albermarle Street. 1844. Pp. A3 – 272. Letter VIII, Kingston, pp. 122-131. You should never underestimate the scholarly interactions that take place at the various cultural establishments throughout Kingston. Recently, I enjoyed the ambience of one of the city’s popular places located opposite Robertson Davies’ “St. Nicholas” Cathedral. To my surprise, I encountered a fellow professor emeritus, Ian Nichol (what an appropriate-sounding name for a geologist!) who enquired about my talks concerning “Rideau 175” and the UNESCO World Heritage designation. In particular, he wanted to know if I knew anything about bytownite. Always one to admit to ignorance en route to enlightenment, my confession resulted in the recruitment of another geological emeritus, Professor Dugald Carmichael. And this is how I was introduced to the story of bytownite, its Rideau Canal connection, and a whole list of personae dramatis. (Excuse the classical language but it was because “I had the Latin” that I didn’t become a coal miner: an inside joke that’s “beyond the fringe!”). Really, the principal source for all this is an article by H.R. Steacy and E.R. Rose in the Mineralogical Record of March-April, 1982. It tells the story of a “By-product” (ouch!) of the construction of the Rideau Canal: bytownite. They open their exercise in forensic geology by noting that the absence of rigorous analysis in so many 19th century geological classifications resulted in the rushed assignation of some 22,000 names to a mere 6,000 distinct species. One of these was bytownite. It all started with a visit to Bytown in the 1830s by one Dr. Andrew Fernando Holmes, a physician, chemist, botanist, and, incidentally, the first Dean of Medicine at McGill University. Perhaps he was motivated by the technological sublimity of the works along the Rideau Canal; perhaps he wished to meet with his colleague, Dr. James Wilson of Perth. Whatever the reason, his scientific curiosity prompted him to collect some geological samples from a boulder on the Richmond Road near the old trail to the Deschènes Rapids on the Ottawa River. Holmes then forwarded his samples to Dr. Thomas Thomson, Regius Professor of Chemistry at the University of Glasgow. In 1836, Thomson analysed two portions of Holmes’ sample and concluded it represented a new mineral species which he named bytownite. But the story didn’t stop there. A later analysis in 1838 by Tennant, identified the find as amphodelite (anorthite). And then, fifteen years later, a mineralogist and chemist with the Geological Survey, T. Sterry Hunt, published a slightly different explanation based on differences in Tennant’s and Holmes’ analysis of proportions of lime, soda, and potash and declared it to be anorthite (thisosurite). The story next shifts to Germany. In 1864, Professor Gustav Tschermak (1836-1927), a mineralogist at the University of Vienna, had presented a theory that plagioclase was an isomorphous mixture of albite (sodium feldspar) and anorthite (calcium feldspar) and he arranged the variation of these in a progressively calcium-rich series: albite, oligoclase, andesine, labradorite, bytownite, anorthite. That is, bytownite was included in the series and the original name assigned by Thomson in 1836 was, thus, formally established. However, Dr. A. Krantz, a mineral collector and dealer of Bonn, provided a sample of what was, ostensibly, bytownite to Professor Ferdinand Zirkel (1838-1912) an eminent German mineralogist at the University of Leipzig. In 1871, Zirkel declared the sample to be composed of a mixture of anorthite, hornblende, mica, quartz, and magnetite. Accordingly, he recommended that the name bytownite be dropped! However, the provenance of Zirkel’s sample was somewhat dubious and the Thomson-Tschermak designation stuck. Life’s leaden metals into Gold transmute. This is the first article in what we hope is a series from Bob Sneyd. Bob is presently the President and CEO of the Centre for Sustainable Watersheds in Portland (www.watersheds.ca) and has been extremely active with various Rideau environmental initiatives (many instigated and organized by Bob). But, a “few” years before his involvement with these activities, he completed a Master of Arts thesis at the University of Toronto on the topic of the Rideau Canal. The thesis was titled “The Role of the Rideau Waterway, 1826-1856.” The extensive research that he put into this thesis makes Bob the definitive expert on this fascinating period of Rideau history. So while some so called “experts” have erroneously called the Rideau Canal a failure, Bob, through extensive high quality research, has clearly demonstrated that the canal was in fact a success. The canal went far beyond its original mandate to provide a safe military supply route to the naval base at Kingston - it played a pivotal role in the early development of our nation by being a very successful Canadian commercial water route and by being the main route used to safely deliver tens of thousands of loyal British immigrants into Upper Canada. In this article, Bob takes a fascinating look at the early commercial role of the Rideau Canal - kww. Transportation is civilization, it has been said. Certainly for Canada, transportation has been the stuff of building this country in every age. The Rideau was completed in the middle of the canal-building era, barely a generation before construction frenzy turned to railroads. The story of its initial role as a vital transportation artery is, above all, paradoxical: of Britain’s largest overseas military expenditure, becoming a vital component in the development of the North American economy. For its first 20 years the military canal was caught up in a world of commerce, when it became the linchpin of a grand trans Atlantic and North American trading system. Yet it is a story that has been largely neglected for 175 years. The North American economy was shifting to new staples such as potash, flour and grains, for export to European markets. How could the proud, old Canadian trading system---focused on the St. Lawrence River and organized in Montreal---compete with that more favoured Erie Canal, with its year-round rival port of New York? The unimproved upper St. Lawrence was a burdensome and costly voyage at best---a tedious 12-day journey, fraught with danger---and at an exorbitant cost that virtually gave New York control of the growing western trade in these bulk, staple products. How was it, then, that this somewhat roundabout, “backwoods” military canal to Lake Ontario saved the day, to enable the Canadian system to play such a prominent role in international trade? Simply put, waterborne commerce followed the easiest, cheapest and safest route. A triangular pattern soon emerged. Imported British manufactured goods were transferred from the ocean-going ships to barges in Montreal. They were then towed by steamboats up the Ottawa River to Bytown, through the Rideau, and transhipped to lake schooners at Kingston. The heavy, cumbersome products destined for British and European ports were, in turn, reloaded from those schooners to the barges, and run directly down the St. Lawrence to Montreal, shooting the rapids along the way. What made the Rideau route indispensable was the fact that those large steamboats – the biggest ones built expressly for the Rideau, thanks to John By’s foresight and insistence on building larger locks -- were powerful enough to tow a string of as many as 12 barges, of up to 200-ton capacity, to Kingston. Just what the staple trade needed! Without the availability of such craft in Kingston, that export trade would have been bottlenecked there, and surely routed the American way through the Erie to New York, avoiding Kingston altogether. By 1834, given its cost and security advantage over the St. Lawrence, 75 percent of westward traffic was using the military route. Merchandise volume quadrupled over the last half of the decade, while it was evident that the Rideau was supplying all the barges for the down-trade. In spite of the sluggish times in this decade, it was clear that the Rideau had become the vital link in inter-provincial trade. Even the rumour of an interruption in the trade prompted an Upper Canada cabinet minister to write the Lieutenant-Governor of the “serious inconvenience” and “diminished confidence” of forwarders should navigation be impeded. Had a dam broken down, the interruption would have been “ruinous to half the commercial interests of the country”, testified Hamilton Killaly, the chairman of Canada’s Board of Works. By 1840, just when prevailing economic conditions were becoming most opportune, the Rideau was launched into the six years of its greatest boom in international trade. Six forwarding companies were now engaged in the trade, led by McPherson and Crane, with 11 steamboats, and 45 barges averaging 90 tons. Together, the other five companies ran 10 steamers and 90 barges. Over a 210-day season in 1841, 1,650 vessels passed through the waterway. It was not uncommon for a lock station to pass five steamboats a day, each towing from five to eight barges. A typical entry in the journals at Jones Falls showed the steamer Margaret passing every second day, in its busy shuttle service between Bytown and Kingston. The Montreal and Kingston boards of trade lobbied for the maintenance of low tolls, pointing out that the broad economic interests of the Canadas were interwoven with the carrying trade and dependent on transportation facilities. Higher tolls would in effect divert commerce through the Erie to New York, and “strike a blow at the prosperity of United Canada,[from] which it may never recover”. Could there have been a more insightful, dramatic statement by contemporaries of the degree to which the Rideau route had become the keystone in the ‘commercial empire of the St. Lawrence’? At the same time, it should be remembered that British preferential tariffs worked to Montreal’s advantage: American wheat transported in British ships, or ground in Canadian mills, entered the British market at the lower Canadian rates. The 1842 season was busier than ever along the Rideau. It was not uncommon to pass four or five steamboats a day, with their barges. The trade brooked no delay; lock workers were on call day and night. On June 6 at Jones Falls, for example, the canalmen worked ten hours during the day and five at night. Again in 1845, the route continued its now familiar function as a key link in international Canadian trade. It turned out to be the year of its largest revenue, almost 13,000 pounds. Profits since 1843 had totaled 5000 pounds! 1846 marked the end of an era for the imperial canal even as, coincidentally, it marked the collapse of the old colonial system that had supported it over the past two decades. Gone were the old preferential tariffs with Britain’s adoption of free trade. The adolescent Canada was being thrust out of her parental home, just at the time she had gained political independence, with the culmination of its long struggle for responsible government that same year. * * * Perhaps these words remain as good as any summation of the Rideau’s central economic significance during this most crucial epoch in Canada’s development. Can we, then, use them in 2007 to support a more comprehensive understanding and sense of gratitude of our now treasured waterway, as we move forward in the next 25 years toward the canal’s bicentenary? The numbers to the end of August 2007 are in and they show a 15.5% increase in the number of vessel passages compared to 2006. In 2006, to the end of August, there were 62,965 vessel passages and in 2007 there were 72,749 vessel passages. The origin of the boaters remained essentially unchanged from 2006 with 64% from Ontario, 24% from Quebec and 12% from the U.S. The busiest locks in terms of vessel passages were, as always, Narrows (5,934), Newboro (5,620), Chaffeys (4,876) and Davis (4,650). The least busy were Beveridges (1,141) and Ottawa (1,623). 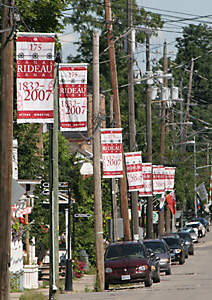 Okay - it wasn’t actually a contest - but if it had been, Merrickville would have won for the number of Rideau 175 banners it has on display. It is quite spectacular. "Davis Lock - A Contrast of Seasons"
There were many initiatives, by both groups and individuals, that helped to celebrate Rideau 175. 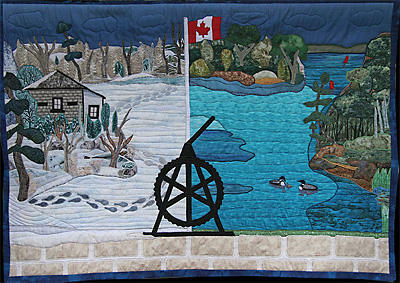 In this case, a quilt, which won first place in the category “The Rideau Calls” in the quilt competition for the International Plowing Match (held at Crosby in mid-September). Friends of the Rideau is a volunteer, non-profit organization, working in co-operation with Parks Canada to enhance and conserve the heritage and charm of the Rideau Corridor. For more information contact: Friends of the Rideau, 1 Jasper Avenue, Smith Falls, Ontario K7A 4B5 – Tel: 613-283-5810 Fax: 613-283-2884 – Email: info@rideaufriends.com – Website: www.rideaufriends.com.